In this brief yet dense biography, the newest in HarperCollins's Eminent Lives series, Hitchens (A Long Short War, etc.) proposes that Jefferson ""designed America"" when he wrote the Declaration of Independence, establishing ""the concept of human rights, for the first time in history, as the basis for a republic."" Hitchens is quick to point out, however, the obvious contradiction-that Jefferson was both an advocate for freedom and a slaveholder. 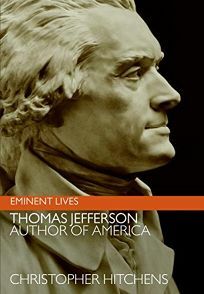 Beginning with his aristocratic upbringing, which Jefferson purportedly viewed with ""indifference,"" this biography explores both the private and public aspects of Jefferson's life, from his political philosophies to his affair with his slave Sally Hemings. In an attempt to set the facts straight about Hemings, Hitchens explains that, while technically a slave, she was actually related to Jefferson's wife and was treated ""more like a privileged housemaid."" Presenting countless excerpts from Jefferson's writings, Hitchens closely analyzes the President's words to reveal the Enlightenment ideas that shaped American policy, such as the separation of church and state and the prohibition of cruel and unusual punishment. This opinionated, lively narrative sheds light not only on Jefferson's complex personality but on the politics of his time, making it both a fascinating character study and an excellent review of early American history.